UTC selected nylon over polyester because nylon will stretch and grip materials better. This allows for more uniform tension and gives the tyer the "feel" for maximum tension. Nylon is the same strength as polyester (given the same denier) and offers the added benefit of more intense colors and a larger range of colors. Because nylon stretches, it grips material tighter and makes the fly more durable. UTC's thread is flat with only the minimum number of twists needed for production. This is important because the number of twists in the thread determines how flat it can be wrapped on the hook. The flatter the thread is wrapped, the more slowly it builds up. This is a huge advantage when tying small flies or when tying close to the eye of the hook. A flat thread also grips and covers materials with fewer thread wraps. Our spools are sized and designed to turn smoothly on standard bobbins. Each spool has a color coded end cap for product identification and to secure the tag end of the thread. In our opinion the best thread made deserves to be spooled on the best spool. We chose 4 different denier threads in a uniform progression of size and strength to meet every fly tyers needs. Denier is the textile industry's measuring standard for filament size. To measure a thread's denier, 9,000 meters of the thread are weighed. If the weight (calculated mass) of the thread is 140 grams, then that thread is considered a 140 denier thread. Using this system it is easy to understand that a 280 denier thread is twice the mass of a 140 thread and, thus, is larger in diameter and stronger. We are confident that all fly tying thread manufacturers and distributors will soon classify all of their thread in this manner. Currently most fly thread brands uses the "0" (Aught) system. In this system the larger the number in front of the "0" the smaller the thread. For instance 8/0 thread is thinner than 6/0 thread. This numbering system is totally arbitrary and varies widely between the manufacturers. When comparing threads of different brands, we suggest you do not use the Aught system because the only accurate way to compare sizes of threads is by denier. 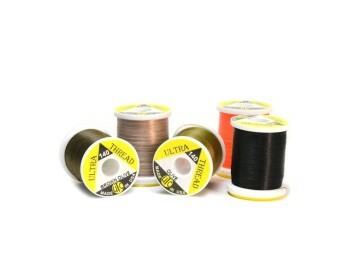 Ultra Thread is produced in 4 different deniers (70, 140, 210, and 280) to meet the needs of every fly tyer: UTC 70 This is a great size for tying the smallest of flies and for tying with low bulk on larger flies. It is the ideal choice for dry flies, nymphs, and midges size 14 or smaller. UTC 140 (6/0) Excellent for the majority of flies, it is the perfect choice for size 2 - 16 flies. Due to its vibrant sheen and excellent color retention, it is a good substitute for floss on small flies. Available in 33 colors. UTC 210 An excellent choice for saltwater flies and large streamers. Perfect for spinning hair on bass flies without being too bulky.